After less than an hour of navigating the tandem bicycle through the crowded sweaty streets of Iquitos, Peru we were parched. Our bodies were perspiring relentlessly in a failing attempt to combat the combination of radiant heat from the Equatorial sun and body heat from the thousands of Peruvians packed into the market. We didn’t have any water and just as we were about to overcome our moral opposition to purchasing bottled water and accept our burden of guilt, we saw our salvation: a man selling coconuts. Under the blue shade of his street carts’ tarp was a single cooler laden with coconuts. He was removing the green globes methodically, skillfully butchering them with a machete and passing their radiant coolness on to the paying customers who drank through red straws. After one look at each other, Jessica and I had crossed the street and ordered our salvation from the heat of Iquitos, Peru. The fresh coconut water was the embodiment of coolness, sweetness, and light. It was perfect in every way. We sipped as slowly as our willpower would permit, that this glorious moment might not pass too quickly. It passed too quickly. We handed our biodegradable container to the vendor who attacked it again to expose the young coconut flesh to us. The flesh was gelatinous, mildly sweet, and surprisingly filling. It was this glorious experience that came to mind one week later when I saw coconut trees alongside the road while biking out of Pucallpa. 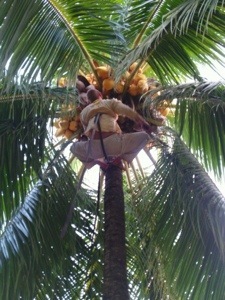 Under my sun baked skull a plan was forming to have the sweet coolness of coconut water as the fruit of my own labors. I was weak and fatigued from the combination of a respiratory infection acquired from a crowded riverboat ride and mind blowing leg soreness cause by a fool-hearty strength training program on the same boat. I was soft pedaling on the front of the tandem dreaming of coconuts, while Jessica was powering on from behind and encouraging me. We stopped early on account of my fatigue and the heat. The place we stopped at just happened to be overrun with coconut trees. 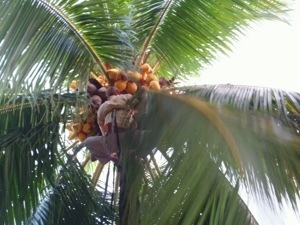 The trees within reach of the children had been stripped but the higher ones were laden with heaps of golden coconuts. We asked the proprietor why the other coconuts had not been harvested, but no satisfactory answer was offered. Indeed in my mind at that point I do not believe any satisfactory answer could have existed. All around there were trees laden with coconuts in the midst of a scorching climate where coconut water provided an ecstatic, albeit temporary, respite. And so I did the only thing I could think of at the time, I pulled my aching body out of the hammock and I climbed a coconut tree. I took the 1inch wide slackline webbing that we had used to workout with on the boat and I tied a loop encompassing the arches of both of my feet. With my feet in this sling, I sidled up to the coconut tree and tied a large loop that surrounding my ribcage and the trunk of the sacred tree. After testing the knots I placed both palms on the trunk, leaned back into the ribcage loop and lifted my feet off the ground. When my feet and the foot sling were wedged against the trunk I stood up and advanced the ribcage sling. It was slow and brutal work. With each advancing stride, my understanding of the movement improved while my muscles slowly fatigued. The deep squat was the closest thing I could find to a resting position and this position further taxed my already burning inner thighs. At 30 feet I reached the crown and the real work began. I took the machete out of my teeth and began hacking. The golden globes did not give up without a fight. The stems were not directly accessible and I had to wrestle my blade through the coconuts to get to a place where I could cut. The small muscles of my feet were burning and cramping while dirty from the crown rained down on me, caking on my skin and forming a salty human mud. After what felt like hours, the first coconut fell, and then another and another. I shimmied down and collapsed on the ground beside ten golden coconuts while the muscles in my legs slowly released their spasming. My machete was not blessed with skilled handling bestowed by years of coconut chopping. It took me nearly twenty minutes to coax the liquid out of the first of my prizes. When I finally drank the fruits of my labor, it was warm and sour. The coconut had been on the tree too long and the era of sweet coolness had passed. We opened one more and removed the flesh before giving up. The rest we left to the proprietor. That night was the first of our 25 day bicycle trip out of the Amazon and through the Andes. That night I was more sore and fatigued than at any other point in the trip. Me in the coconut tree. Notice the sling around my feet and the second sling around my ribcage. These slings allowed me to get my center of mass away from the tree so my contact point would have a more horizontal vector. This horizontal vector contributes to the friction.